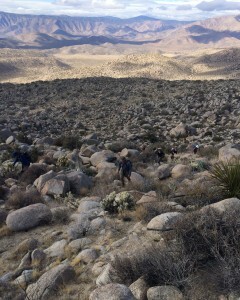 Whale Peak, at over 5,000 feet above the desert floor, hosts a unique ecosystem where you can see the transition from the desert floor to the Pinyon Pine forest above. 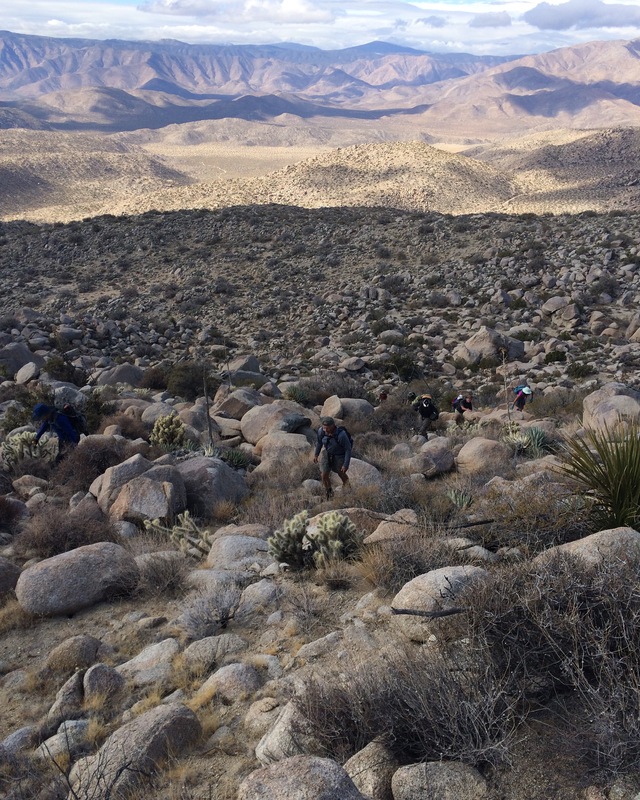 This is one of the longer class 2 cross-country peak bags in Anza Borrego. 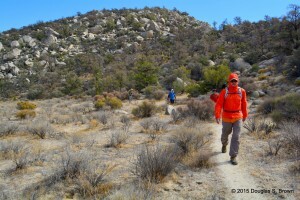 Whale is a classic in many ways and a good beginner trip for those looking to transition from trail hiking to cross country desert peaks. I like to call this one ‘mountaineering without snow’ as it really gives you the feel of a mountaineer, route finding, avoiding obstacles, and generally using all your senses and physical capabilities to get up and down the mountain. From Blair Valley on S-2, drive back beyond the campsites and follow signs about 1.5 miles to Pictograph trailhead. The road is decent and most 2wd sedans should have no major problems. Follow the signed Pictograph trail .5 miles east into a small valley and go directly north towards the base of the mountain ahead. Go straight up, staying out of the gullies on broad ridge. After the first steep dirt wall the terrain will flatten a bit before climbing again. You are now on a broad ridge which can be followed to the summit for the most direct route. There is a small, flat valley slightly west of the ridgeline near the midpoint which can save you some climbing and will allow you to approach the summit from a well-ducked western route As you gain the ridge, try to aim for the left side of the ridgeline, avoiding the cliffs on the east face. You will continue ascending over boulder fields until the final 100 feet or so to the summit which is steep but well protected with no exposed sections and occasional large boulders. If you drift east you will encounter class 3 and 4 terrain quickly. The summit area is broad and offers shade and windbreak due to the thriving pinyon forest. It has largely recovered from recent burns. Views are expansive across the crest of the Peninsular Range from Laguna to Volcan Mountain, Pinyon Ridge, Rabbit Peak, Salton Sea and beyond all visible. Clouds of dust from Ocotillo Wells and Glamis can also be seen. There are numerous campsites at the summit and in the flat valleys just below the summit. Small bivy spots are abundant, of course, no water. For the return, follow ducks to the west immediately down the slope towards the deep gully. This sandy and boulder-strewn canyon will take you down easily, with just a couple of barely class-3 dry falls to negotiate. 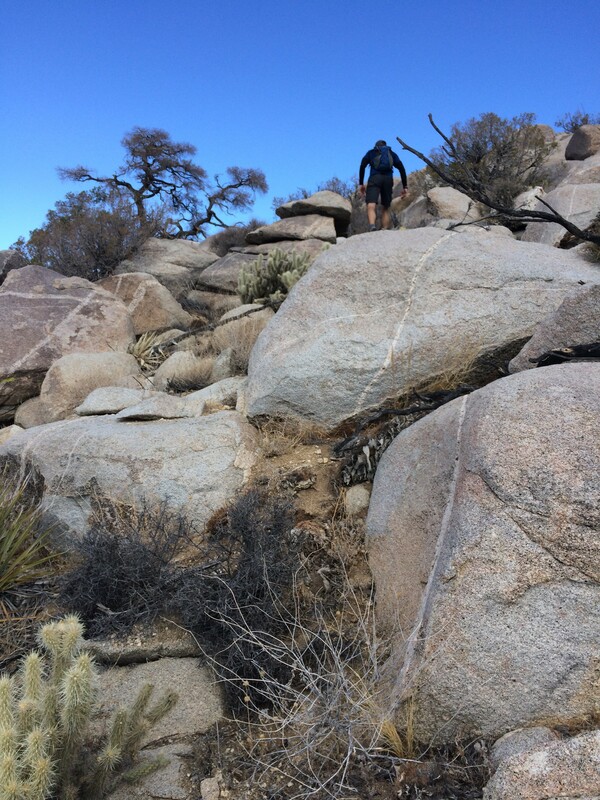 I climbed this with the SD Desert and Mountain Adventures Meetup group. Bob M was the leader, this was a large group including an accomplished mountaineer and a complete novice. Total hiking time was about 5.5 hours, pace was not super fast and we stopped to look at some pictographs on the way back. This entry was posted in Hiking on January 31, 2016 by Sassberto.